Drawing the technically difficult aspects of a car can seem like a daunting task. Mastering this, however, is essential to creating a successful illustration portfolio. This is especially true if you want your illustration emphasis to be on automobiles or technical drawing. The best way to tackle an assignment like this is to go to the basics; identify the simplest shapes and lines in the car engine. By laying down these shapes first, you can simplify drawing a car engine. 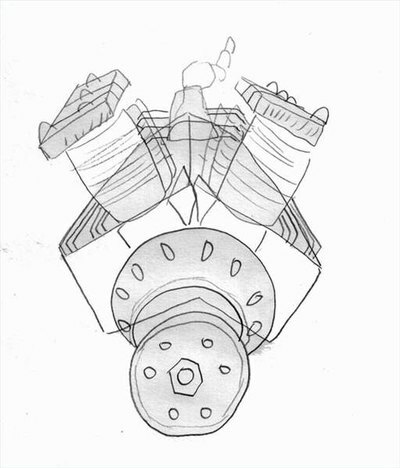 Draw the engine block with two long cubes that meet in the center of the page. This should make the shape look like a wide cube version of an upside-down "v." Add a circle in the center bottom of this shape. At the bottom of the circle, add a smaller circle that slightly overlaps the previous circle. Add the engine cylinders, with three cylinders running up the top left and right sides of the engine block. Add a flat rectangular cube on top of this shape for both sides. 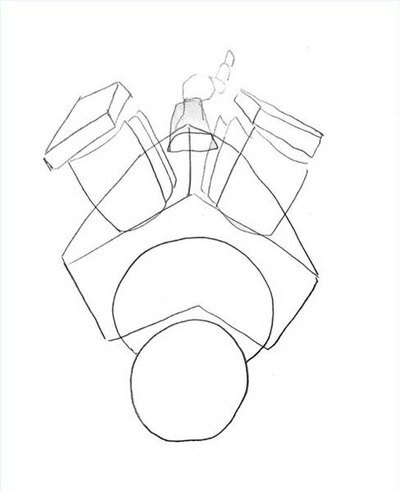 Add three small diagonal cylinders attached to the upper inside of each engine cylinder. Connect these to the opposite side with a horizontal cylinder. Add seven small teardrop-shaped holes around the outside edge of the larger circle on the front of the engine block. Add six small circles around the outside edge of the smaller circle. 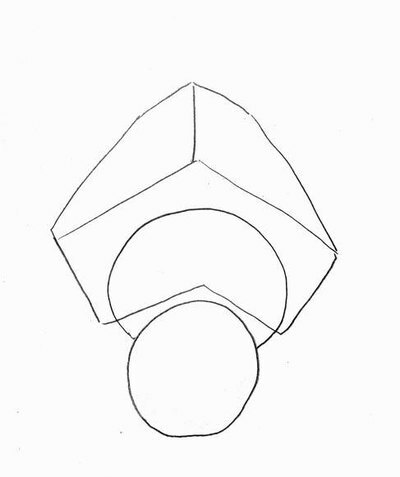 Add a hexagon (a six-sided shape) in the center of the smaller circle to represent the nut. Add a small circle inside the hexagon. Split the top rectangular cube that is on top of the engine cylinders into three sections with three diagonal lines running from the inner edge to the outer edge. Add a valve to the bent cylinders in the middle with a trapezoid shape. Center this on the engine block and directly between the front cylinders. Erase any overlapping pencil lines. Check the back and front of the engine block to make sure you've erase all the guidelines. Ink the entire drawing. Let the ink dry, and carefully erase the pencil lines. Use a ruler if you want to ensure the straightest possible lines. Let the ink dry before erasing the pencil, or your picture will smudge.